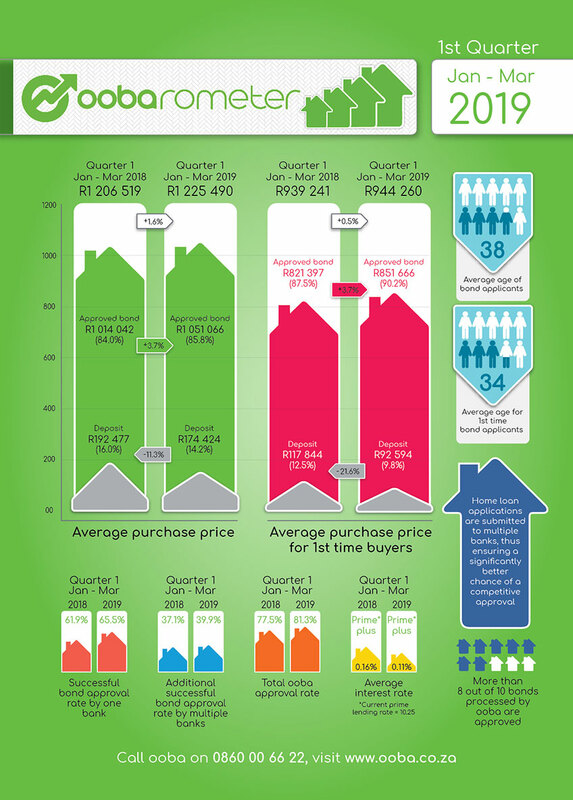 For the first quarter of 2019 (Q1 19) statistics from ooba, South Africa’s foremost home loan comparison service, show negligible year-on-year growth in the Average Purchase Price of 1.6% from Q1 18 to Q1 19. Growth in the Average Purchase Price for First-time Buyers was also minimal at 0.5% from Q1 18 to Q1 19. This means that house price appreciation remains below inflation, reflective of the current uncertain economic and political landscape. Dyer continues “Our home loan Approval Rate of 81.3% in the first quarter of 2019 was the highest on record for ooba since May 2007 and importantly, the approval rate on applications without a deposit (100% loans) has increased by almost 8% on Q1 2018.” The Average Deposit as a Percentage of Purchase Price is down by 11.3% year-on-year compared to Q1 2018, from 16.0% of the purchase price to 14.2% of the purchase price in Q1 2019. Similarly, ooba’s statistics show that deposits for First-time Home Buyers are down by 21.6% over the same period from 12.5% of the purchase price to 9.8% of the purchase price. “More affordable property prices, coupled with reduced bank deposit requirements, higher approval rates and improved home loan pricing create a perfect opportunity for property buyers at present, says Dyer”. Banks are competing for a bigger share of the home loans market by approving finance at historically low interest rates. ooba’s statistics for Q1 2019 show that the average interest rate is 5 basis points cheaper year-on-year. The average rate that ooba achieved for its buyers in Q1 2019 was 0.11% above prime compared to 0.16% above prime in Q1 2018. “Buyers, especially First-time home buyers and buyers who do not need to sell to buy, should take advantage of the more affordable property prices together with the current positive lending environment and invest in property” says Dyer. “By pre-qualifying, prospective homebuyers can confidently make an accurate price offer on their dream property knowing that obtaining bond finance is a mere formality,” concludes Dyer.